A crowd-pleasing treat, this salad travels well for picnics and barbecues. Make plenty, this is one recipe that always goes fast. 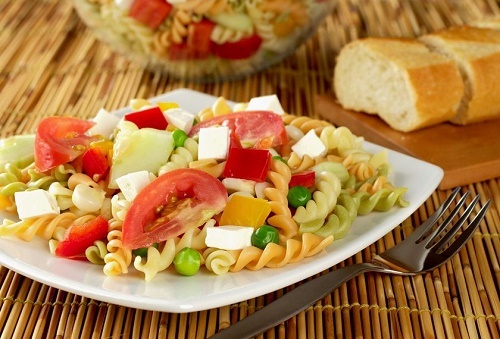 In a large bowl, combine pasta, salami, pepperoni, cheeses, peppers and tomatoes. Sprinkle with the dressing mix and toss well to combine. Cover and refrigerate overnight. You don’t have to marinate this long, an hour will do. But the longer you let it sit, the better the flavors will meld. In a separate bowl, whisk together olive oil, vinegar, parsley, oregano, salt and pepper. Pour dressing over salad, mix well and serve. Mix it up: Give this delicious salad a Mediterranean twist by replacing the Fontina cheese with crumbled feta and adding a jar of marinated artichoke hearts, drained and chopped.